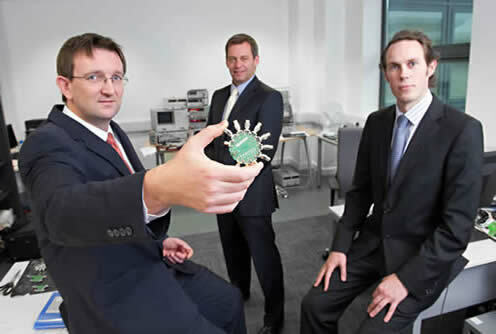 Ferfics, a Cork based company specialising in the development of components for mobile phones and wireless devices, today announced it has secured €1.7 million of new equity funding. The investment is being led by The Ulster Bank Diageo Venture Fund, managed by NCB Ventures. Investment will also be provided by The AIB Seed Capital Fund, managed by Enterprise Equity Venture Capital Group, as well as by Enterprise Ireland. Established in 2007, Ferfics develops high-tech microchips that substantially improve the battery life of mobile phones and wireless devices and can be manufactured at a fraction of the current cost associated with the production of such components. Heaney envisages that in time the increased production, sales and marketing activity will result in the creation of 30 new jobs in the firm’s Cork base. The company will be chaired by Kevin Fielding, former President and CEO of ParthusCeva.